This made me catch my breath – such a simple idea but taken to such a complex level that it becomes a work of art in its own right. This is stop-motion at a very different level to usual – whereas normally pieces within frame are manipulated this amazing video by Kijek / Adamski gains its own momentum in another way. It was made with 2000 silhouettes which were extracted from PVC plates using a computer-controlled cutter. Starting with a single silhouette each is then added at a very fast speed to give the impression of movement. The overall result is, like I said, breath-taking. 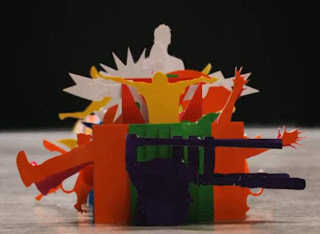 The video was created to accompany Katachi by Japanese musical artist Shugo Tokumaru. Shugo creates every facet of his music, from the lyrics to the recording and mixing and he makes use of a bewildering array of instruments in his music. Given his eclecticism then, this video is more than appropriate, especially when you take in to account the meaning of the song’s title – katachi. The word cannot be translated in to English with a single, comparative term. Katachi is the quintessence of Japanese design: workmanship, form and symmetry joined together in a wedding between beauty and functionality. Essential in Katachi is that objects are created with materials that have been pivotal within Japanese life. Perhaps the use of PVC in this video is something of a departure from conventionality but today’s innovation is, after all, tomorrow’s tradition. Anyway, I bet you play this more than once!